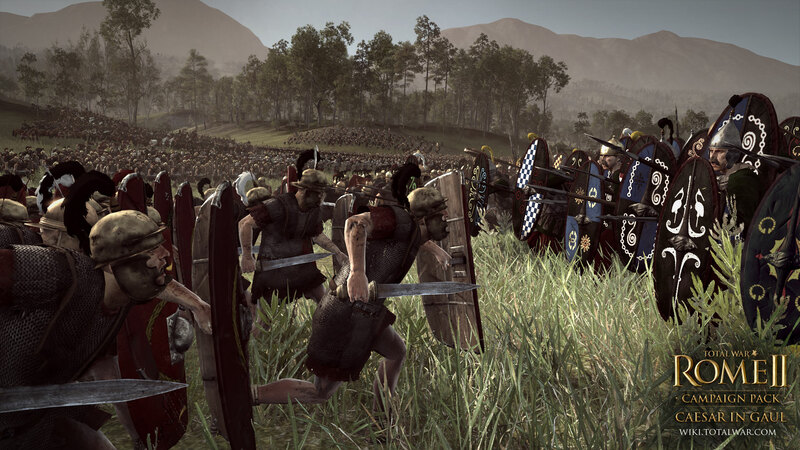 Caesar in Gaul is a standalone campaign pack for Total War: ROME II covering Julius Caesar's war of expansion against the Gaulish tribes. 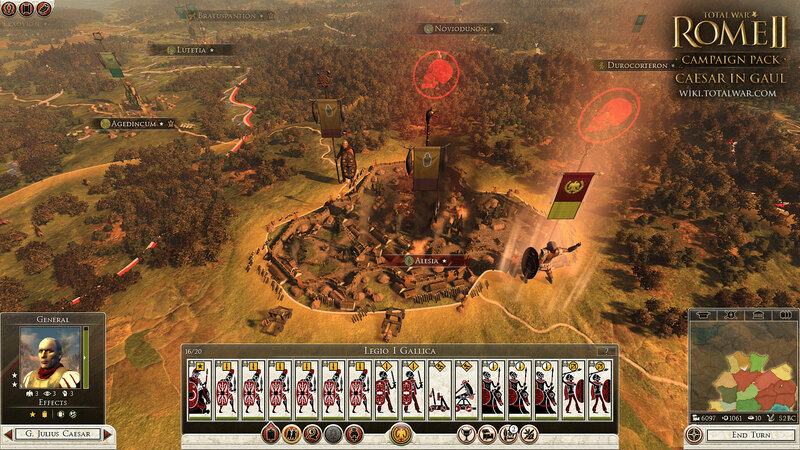 Players can choose from four playable factions in this conflict: the Gallic Arverni, the Germanic Suebi, the Belgic Nervii and Rome, in a campaign inspired by Caesar's Commentarii de bello Gallico (Commentaries on the Gallic war). 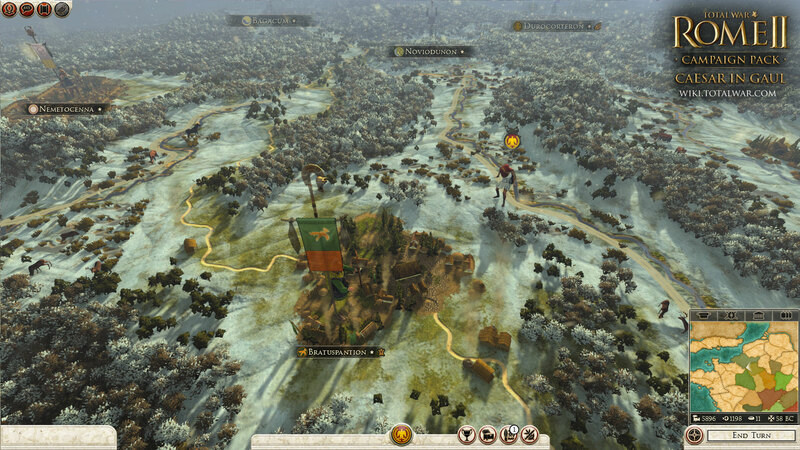 Compared with ROME II's map of Gaul, Caesar in Gaul contains more regions and provinces, more factions (both playable and non-playable), and a series of famous generals and statesmen from history which the player will employ or fight against depending on their chosen faction. A war of great profit and glory for Caesar, this conflict made him extremely popular with the people of Rome… though less so with the senators, who saw him gathering power to himself in a series of events that ultimately lead to his ascension to Emperor. Many factions employ great generals and statesmen from history (for example, Rome fields Gaius Julius Caesar himself, Mark Anthony and others). Each of the four playable factions also has a faction leader who acts as the player's avatar during the campaign. AsCaesar in Gaul deals with a considerably shorter time-span (58-51BC) than the grand sweep of the ROME II campaign, each turn represents two weeks rather than a year. This means seasons make a return. The gameplay effects of these aren't always predictable however, and may vary from province to province. A late autumn may bring a good harvest for example, but a long, dry summer may damage your food production. 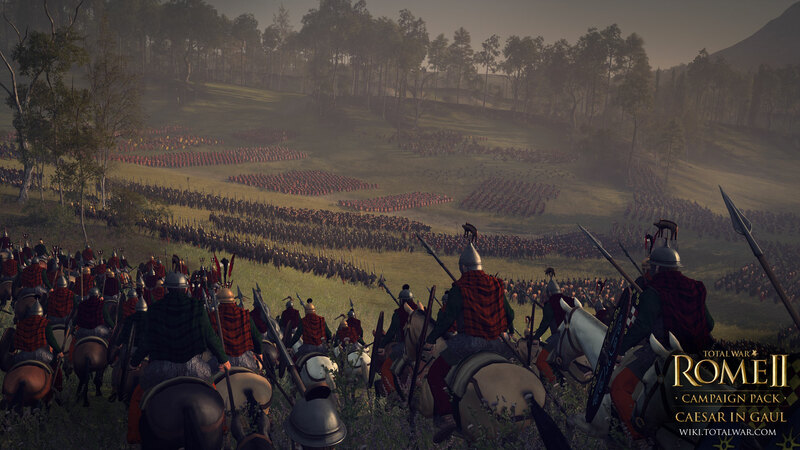 For those players making it through to the mid-game, there will be new challenges to face as a more suitable replacement for the Civil Wars of ROME II. As a Gallic tribe, you'll feel the mailed fist of Rome respond with heavy intervention forces, and as Rome, you'll see the Gallic tribes rebelling and forming alliances against you. 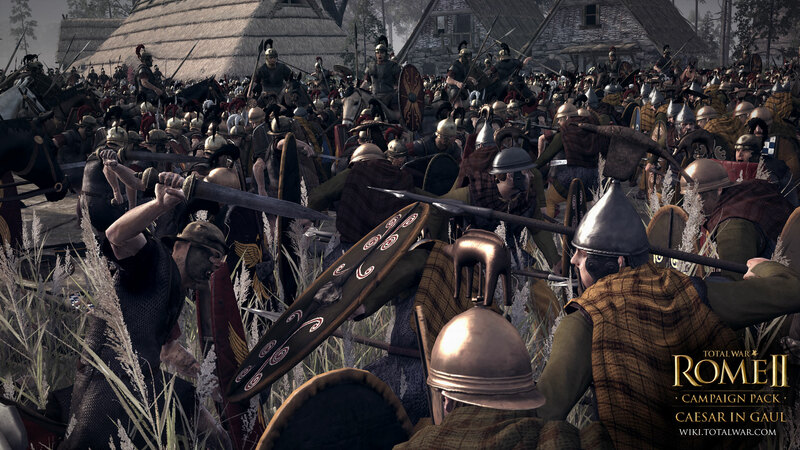 Caesar in Gaul adds the Battle of Alesia as a playable historical battle. Alesia marked the turning point of Caesar's Gallic War, and resulted in the capture of Vercingetorix, who was later taken to Rome and executed at Caesar's Triumph. Set from Caesar's perspective, Alesia tasks the player with maintaining the siege of Vercingetorix's Gallic stronghold. The battle begins with the Roman forces deployed within their own investment fortifications outside the hill-fort. 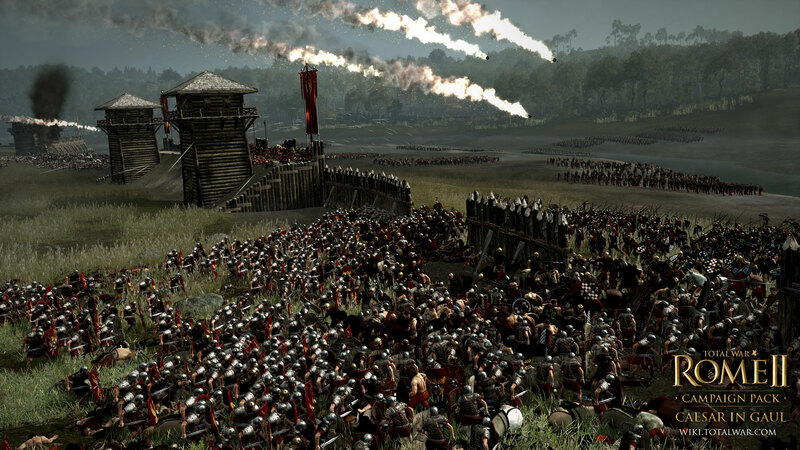 The player must guide the Romans as they weather attacks from both a huge relief army and within the fort itself. Alongside the factions playable within the new Campaign, Caesar in Gaul also adds three new playable factions to the main game. © SEGA. 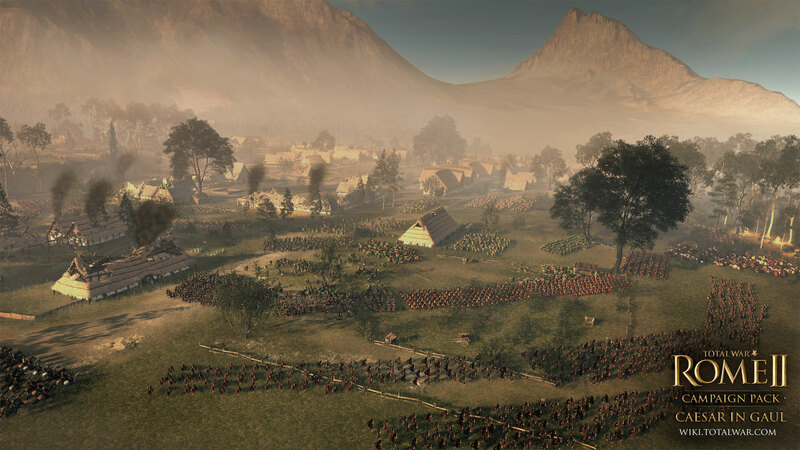 The Creative Assembly and the Total War logo are trademarks or registered trademarks of The Creative Assembly Limited. SEGA and the SEGA logo are either registered trademarks or registered trademarks of SEGA Corporation. All Rights Reserved. All other trademarks are the property of their respective owners.